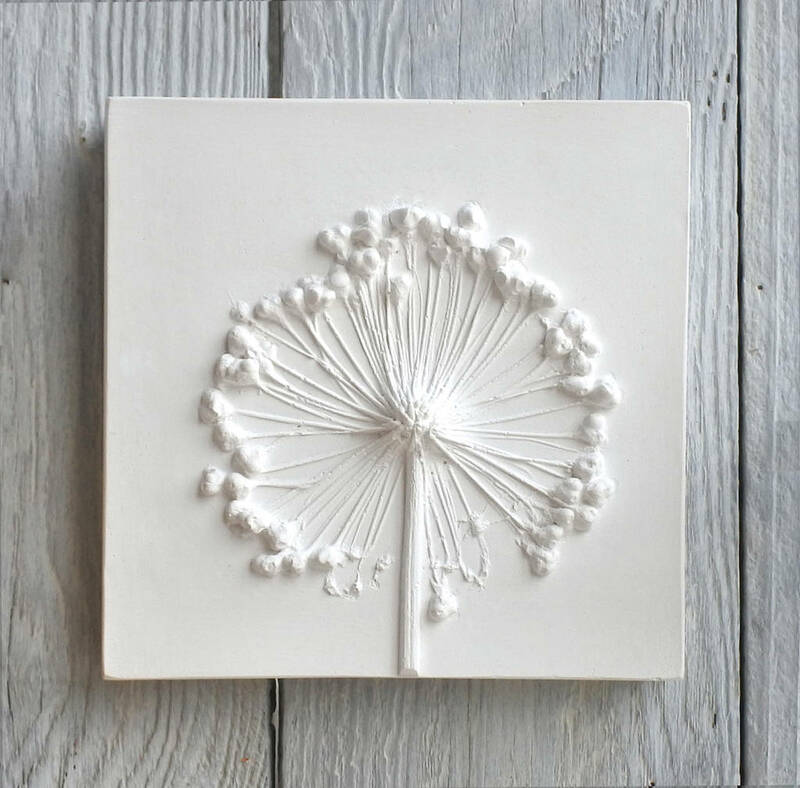 A beautiful limited edition plaster cast tile, featuring a raised impression, made using a real Allium seed head. 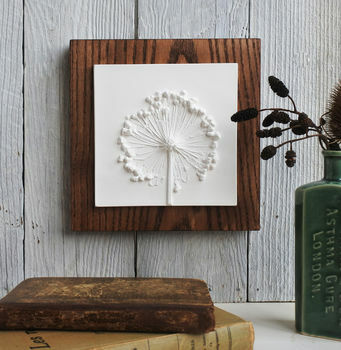 This would make an ideal gift for anyone who loves nature, gardening, or simply the sculptural beauty of plants & flowers. Each piece is signed & numbered on the back, they are all limited editions. 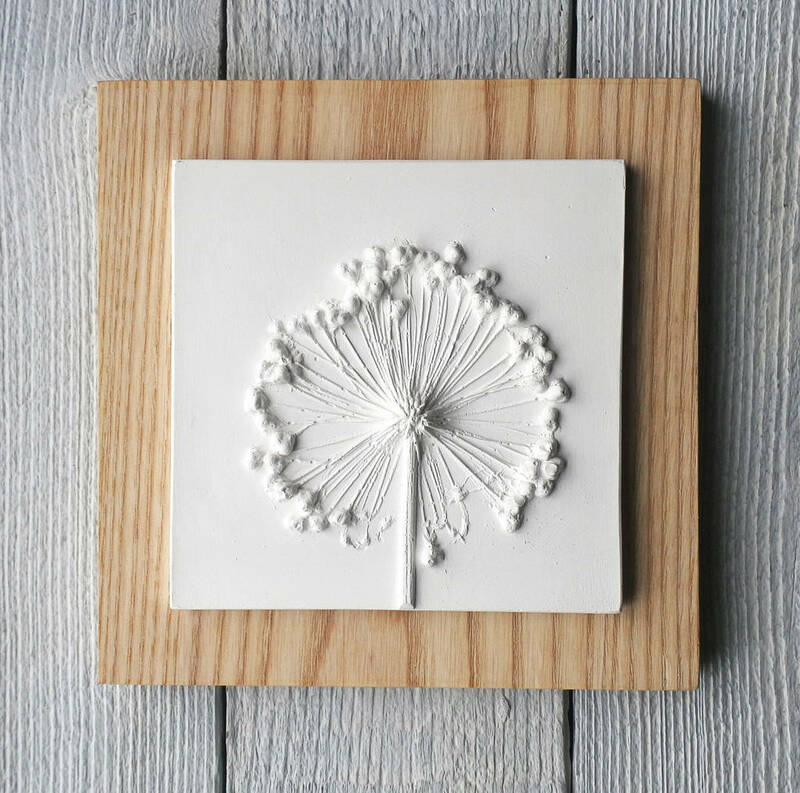 This Allium plaster cast tile is mounted on a piece of hardwood, which provides a striking contrast, there is a bracket on the back for hanging securely on a wall. Or it can simply be displayed propped up on a shelf. The tiles, without the wood, have a small hole drilled in the back for hanging. This Allium seed head was kindly donated by one of my neighbours, Pat. I am going to try growing my own this year! It was pressed into clay, removed and plaster poured over to create the cast. The process picks up an incredible amount of detail to create a beautiful raised impression. 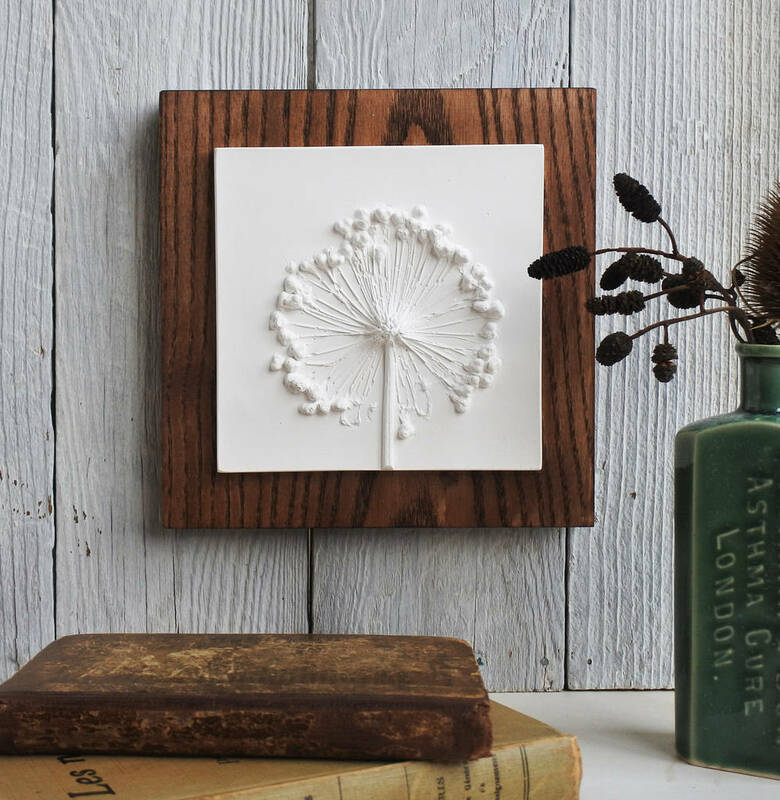 The life of flowers and plants can be very short lived, the process of casting them is like capturing a moment in time, preserving them to be enjoyed long after they have faded away. The process of casting gives them a beautiful sculptural quality and transforms the items into a work of art. 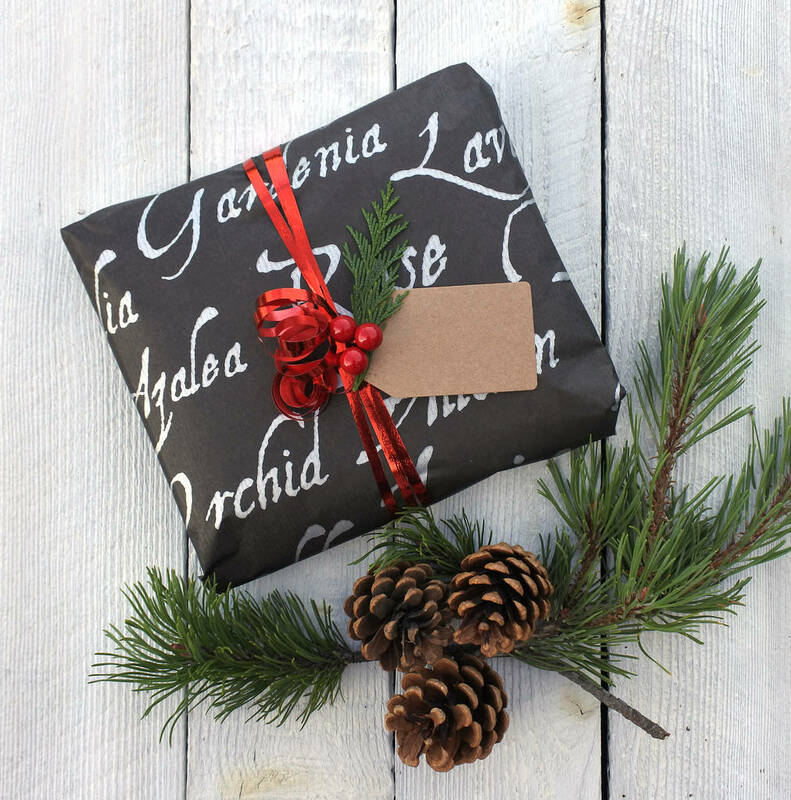 I can provide a Gift Wrapping service for a small extra cost. Using Black paper with Silver text showing various names of plants and flowers. Tied with a contrastiBlue tileng metallic red ribbon. Finished with a buff coloured gift tag. I can hand write the gift tag & send it directly to the recipient. Casting plaster, the tiles are only suitable for indoor use. Avoid placing in rooms with lots of condensation or moisture, or near any direct heat source. 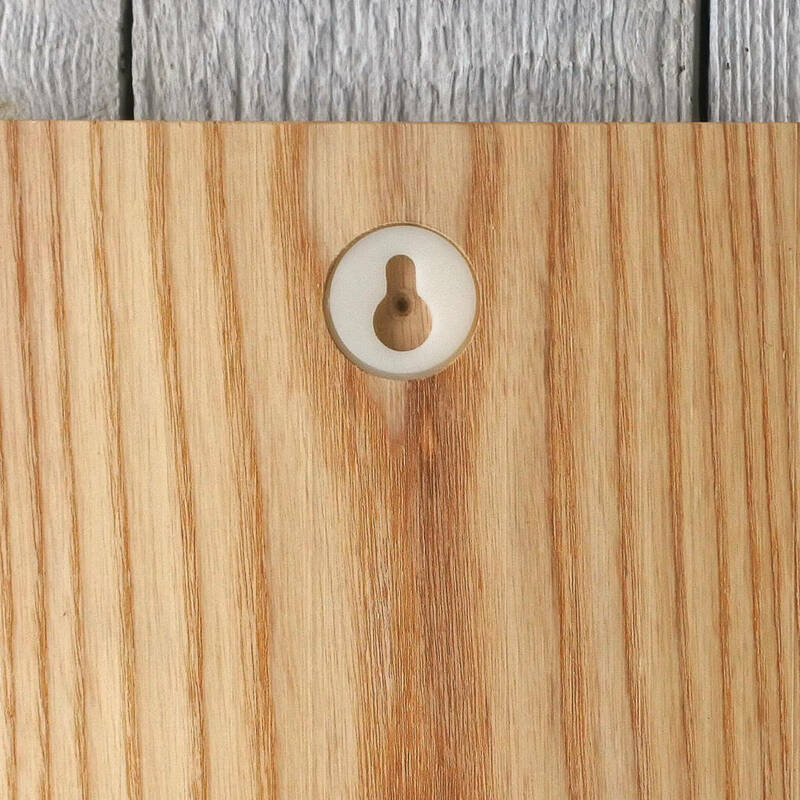 The backing is made from hardwood. To clean dust lightly, avoid handling too much as plaster is porous & may absorb oil from your skin.